'Why Aren't We Dead Yet? : the survivors guide to the immune system' – book review – AiPT! When we think about what we need to do to live, generally speaking, not dying is pretty high up on the list. Our species is so concerned about not dying that we try to mitigate all risks, by mundane means like safety regulations, or ridiculous ones like searching the skies for malevolent beings that might want to take over our planet and kill us all. 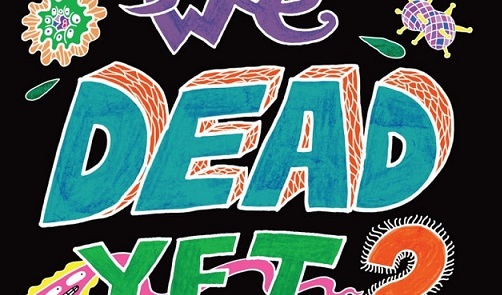 Author Idan Ben-Barak focuses a lot of his attention on not dying, but on a much deeper level that’s neither mundane nor ridiculous, but one we seem to always take for granted. His book, Why Aren’t We Dead Yet? : the survivor’s guide to the immune system, offers a humorous look into our own bodies to examine how our immune systems have helped to protect the human species from going extinct. The book is set up purposefully in a really smooth format over the course of five chapters, with each providing its own answer to the title question. There will be no spoiler alert here, you really should read the book to gain the answers, because context is truly important. Through Why Aren’t We Dead Yet? you’ll receive a few crash courses to familiarize yourself with the parts and functions of the immune system. There’s an abridged history lesson on how immunology evolved as a science, as well as how the immune system evolved over time to the amazing and complex thing it is today. Both innate and adaptive immunity are discussed at length, and occasionally things do get a bit in-depth. Ben-Barak does his best to keep it simple, and when tedious or heavy material gets tough, the footnotes and light-hearted commentary flow, making it a bit easier and exciting to digest. The footnotes and light-hearted commentary flow, making it easier and exciting to digest. He gives a good amount of information on how the immune system occasionally gets it wrong, including sections devoted to immune disorders, where “self” may be identified as a foreign entity, and failed detection of pathogens, where foreign entities may be identified as “self.” The failed detection isn’t really what’s so intriguing — it’s the stealthy, sneaky tactics that pathogens use to hide from our immune system. One of the really interesting things that Ben-Barak does in this book is provide the reader with different schools of thought. He acknowledges that multiple times in the past, we thought we had a grip on how everything in the human body worked, but it turned out to be pretty off-base. Ben-Barak suggests there is much more room for study and to understand truly how incredibly complex this system is. It’s good when a scientist can admit when they may need more information, and Ben-Barak brings in new ideas that are floating around to prove his point that science is constantly learning and changing. There’s a lot of excitement and discussion on immunological research (as of original publication in 2014), and some of the findings are shared, although he is good about staying skeptical, yet hopeful. In short, yes. Why Aren’t We Dead Yet? is a brilliant, science-backed book that is both fun and informative. It is, however, geared to a very specific audience. I mean, lets face it: Immunology isn’t a riveting topic so full of excitement that people flock to it to gain a better understanding. The number of people who might be fascinated specifically by immunology is likely quite a bit less than those that are interested in microbial life in general, and even they don’t make up a vast population. The personal notations and anecdotes put a real human touch on the information. Though this book is written in the simplest language possible in order to be accessible to anyone, you just really can’t talk about the immune system without having some specific terms or abbreviations being thrown around. Ben-Barak wonderfully breaks down the terms, suggests further reading, and includes a glossary. Someone with a background or strong interest in the immunological or microbiological field will have an advantage, but even a novice in these areas could enjoy this book. As long as you are prepared for some deep concepts and are willing to learn more, there’s no reason not to give it a go. The journey you go on will be both informative and fun. The book is hilarious in a science-nerd kind of way, and the personal notations and anecdotes from Ben-Barak put a real human touch on information that can sometimes come off as clinical and complex. Why Aren’t We Dead Yet? may not be for everyone, but it’s definitely well-written, researched, and thoughtful. It makes immunology more relatable and fun, while unpacking a lot of complex information. There is a fair amount of history, research, optimism, and a very warm, inviting feel to the entire work. Probably not something to walk blindly into without at least a little knowledge of the immune system or microbiology, but would make a brilliant companion text for those with interest or taking coursework.